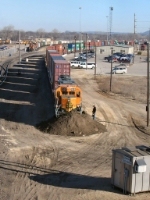 Description: BNSF 2120 sits in the dirt pile after it got away from the RCO guy. Description: View of the front truck in the dirt pile! RCO screw up. Description: RCO guy looking at his little mess. Description: After two days with heavy rain a puddle reflects the BNSF 2120's image.